And he certainly means business! 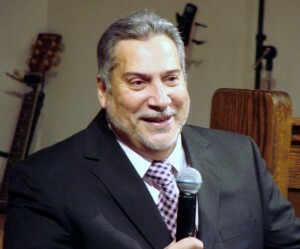 On December 12, 2010, we ordained Miguel Ten as a Marketplace Apostle and Pastor. In 2010, the company he founded in 2002 was recognized by the Greater Springfield Chamber of Commerce as the Minority Owned Business of the Year and for outstanding attainment by both the House of Representatives and Senate of the State of Ohio. He is a specialist in human resources and a humble man indeed, giving all the glory to Jesus Christ, His Lord and Saviour. A true apostle, Miguel Ten is a wise master builder laying spiritual foundations and establishing people and good things in the business realm and in the church (1Cor.3:10). He is a “spiritual father” in the faith both in business and in the church (1Cor. 4:14-15). He is a biblical counselor, and perfects and encourages the saints. He has all the other biblical qualities that mark him out as an apostle and pastor. Over the course of 2010, he counseled three church pastors, six business-owners, and four young men whom he was helping to develop their own businesses, in addition to everything else he was doing in the church and as President and CEO of his company. God called him, shaped him, and has now commissioned him. The ordination service took place in Springfield in the beautiful sanctuary of New Hope Foursquare Church by kind permission of Pastor Kevin Moehn. About 200 attended. Apostle Miguel was part of RiverSong Church in Springfield. Pastor Jim Britton fully approved of his ordination and indeed assisted in the worship part of the service. Pastor Jim, Pastor Kevin, and others, including several of Miguel’s colleagues and employees, and members of his family, prayed for Miguel during a moving time of open prayer. We believe God is pleased that we took this step to commission Miguel to take the business mountain in line with the strategy He revealed in 1975. The apostle Paul is the supreme example of a marketplace or business apostle. He was equally at home in a church as in the marketplaces of key towns and cities; and spent little time in a church in his 30-plus years of ministry. His longest stay in any one church was 2 years in Ephesus. Since his ordination, Pastor Miguel has founded a successful Christian Business Leaders’ Club. He is also co-founder of One Heart Ministries, a ministry that supports pastors and ministers both materially and emotionally. Pastor Miguel recently joined New Life Church of Springfield as Associate Pastor, having served as Associate Pastor at New Hope Church, Springfield from shortly after his ordination. God also has him focusing on Jail Ministry where he’s very effective in reaching prisoners with the Gospel. Miguel delivers a dynamic testimony under a great anointing and is certainly putting it to excellent use. He also has a wonderful teaching ministry. “I so love to teach,” he says. All this is in addition to continuing as Chairman and CEO of First Diversity Management Group.